← Who The **** was The Siegel-Schwall Band!?!?!? 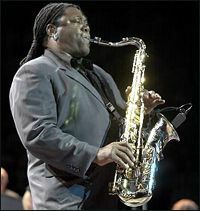 This entry was posted in Life Events and tagged Bruce Springsteen, Clarence Clemons, Jungleland, The E Street Band. Bookmark the permalink. September 30, 1985-my girlfriend at the time and I drove up to Ontario to pick up her cousin & fiance, and we headed to the Los Angeles Coliseum to see Bruce Springsteen and the E Street Band (2 of the tracks on the live 75-85 anthology come from that show). I didn’t truly “get” Springsteen until that night….just an amazing show, and the Big Man was just as captivating as the Boss himself on stage, and as you said, he had such a unique sound. I was blown away by his playing on Cadillac Ranch and Born to Run-such power, such soul. I envy you. I never got to see them live except on TV and, as you know, it is not the same thing as a live performance. I have the live 75-85 on vinyl. I am planning to blog about that set. It is a very big project and my have to be broken up into more manageable chunks. I had a chance to see them here in Dallas on their last tour, but I had read reviews that said it was hghly political and it just turned me off. Now I wish I had gone. Hind sight… but who knew Clarence would die so young? Thanks for the comment. Hope you and your wife are doing well.